"the police could have shot her in the leg or tasered or tackled her rather than shooting to kill, therefore ALL police are bad"
"all people with Asperger's syndrome can become knife wielding maniacs"
To my surprise and delight, those responses weren't forthcoming. Instead our media mainly discussed the difficulties that police face in situations like this and the problems that people with Asperger's syndrome have when it comes to understanding police direction. It was a very mature response from our media. I'm not going to go over things here because I didn't know Courtney, suffice to say that my heart goes out to Courtney Topic's family. It was real tragedy and I wish them all best in the long road of coming to terms with it. What I do want to do however, is to recount a police-experience of my own in the hope that it advances the understanding of how people with Asperger's syndrome can can get those vital and seemingly obvious police communications so wrong. The event took place about twenty years ago during my part-time university days. I was driving home late one night when the police radar caught me speeding. In those days before speed cameras, the police car had to give chase. I was pretty focused on driving home and I believe that they chased me for a couple of kilometers before I even realized that they were there. I pulled into the extreme outer lane and slowed (but not stopped) to let them pass. It was probably another kilometer before I understood that I wasn't in the way of their journey, I was their target. Needless to say, by the time they got the desired response out of me, I suspect that they were probably already more than a little annoyed. As I pulled over, I began to develop a bit of a panic, not a full on meltdown, though it might not have taken much but a panic nevertheless.. I have difficulty dealing with authority figures, not just police but all kinds. For example, I've always found talking to the CEO's of various companies I've worked for to be extremely harrowing and confrontational. It's not unusual and I frequently experience an alarming loss of executive functioning when I'm face-to-face with authority figures, resulting in poor on-the-spot decision making. As I stopped the car, my head began to flood with thoughts, chief among them was my own lack of resources at the time. I didn't want to get a speeding fine because I didn't have much money left. I also remembered a TV show which had been aired about 10 years previously. 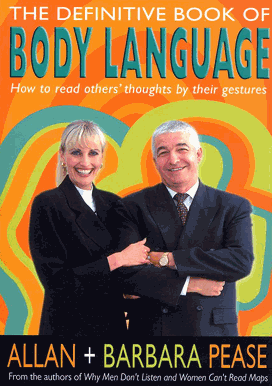 The show was by Allan Pease and it was on "Body Language". There was a whole section in there on talking to superiors in a way that minimized their aggression. From memory, it said to ensure that your body was in a lower position and to go to them, rather than making them come to you. Thus allowing them to remain behind their "powerful desk". Naturally, I decided to apply to this situation. Unfortunately, the police had parked quite a way behind me -- now that I think about it, it's probably some sort of Police procedure. They were also taking their time getting out -- again, now that I think about it, they were probably "running my plates". I decided that I'd better hurry if I was to cover the distance and get to them before they came to me. Instead of getting out, the police crouched down behind their doors. They shouted again but I couldn't hear. It was dark too and they had headlights on, so I couldn't really see what was happening. Finally as I drew very near, I realized that they were shouting STOP! and then I realized that they had drawn their weapons. I can't remember a great deal about the rest of the night aside from the fact that the police were very annoyed with me. They asked me why I reacted the way I did as I said that I was trying to save them from having to walk to me. They were still very suspicious but I couldn't tell them about the psychology because that would give away my "advantage". In the end I was fined, I lost points off my licence and they conducted a very intensive search of my car. They were most disappointed (and confused) that they didn't find anything suspicious there. Of course, after the fact, I can see how my best intentions may have seemed threatening but at the time, from my point of view, it was the police who escalated things out of control. One of the things that people with Asperger's syndrome often do is assume that others can understand what is in their minds without actually communicating. I was lucky that day that the police officers involved were calmer than I. Sometimes, even the slightest miscommunication can end in tragedy. Wow, I think if you were in present time North America, you would have been shot. I really fear this with my son. I, too, have issues with authority... not that I am rude or noncompliant or anything, I just get too nervous and sort of shut down. I've also had run-ins with the police. It was often a case of my being in the wrong place at the wrong time, like giving a ride to a relative who turned out to be buying crack! The police's response to me was usually to assume I was high on drugs. For a while I carried around a paper that explained my Aspergers and that I wasn't violent or on drugs. It helped. Thanks for sharing Gavin. There has been a lot of chatter in the Aspie facebook group that I am in about this particular incident. As I have been very time poor lately I have not read all the articles relating to this incident but it is truly a tragedy to see such a young life being taken away. Not knowing in-depth details about this incident I cannot comment if the situation could have been dealth with differently. Hopefully though, through this terrible tragedy and the investigation that currently surrounds it can bring attention to the fact that police in Australia should at-least get some training on assisting people with Autism. On an unrelated note I am currently looking to networking with other blog writers/advocates on the spectrum and I would love it if you could go on my blog and use the contact form on the top right hand corner of the page. http://bensaspieblog.blogspot.com.au/. Thank-you and have a good week. Fwiw, my family has a history of mental illness severe enough to have warranted a psychiatrist, meds and the occasional in-patient stay starting in grade school for my sister and I. Both of us are alive as the result of an incredible amount of psychiatric/pharmacological scaffolding. This young woman went after police with a knife. What happened was tragic but inevitable. It's unreasonable to expect police to merrily let folks with weapons approach them and do NOTHING!! "One of the things that people with Asperger's syndrome often do is assume that others can understand what is in their minds without actually communicating." I have met so many people without ASDs who do the same "you should have to care what I think, I shouldn't have to care what you think - I shouldn't even have to ask myself whether or not you can possibly know what I mean" thing. "This young woman went after police with a knife. What happened was tragic but inevitable. It's unreasonable to expect police to merrily let folks with weapons approach them and do NOTHING!!" For all the police knew, she was just another person going after them with a knife. For all she knew, they were just more cops. The police need better training for dealing with people going after them with knives. People with ASDs need better training for dealing with police. I have to say Police+Guns=This is Inevitable.The bobbies here in England started making me uncomfortable when they started wearing stab vests and relabeled themselves a Service. Not the right thing to happen; the job attracts too high a proportion of the wrong type of people. You live in it and have become desensitised to the smell. Your car incident? Those guys had lost sight of normal. Being aspie, at some point in the week I will have to pause and think myself into the other persons shoes. Too many cops either lose that ability or didn't have it in the first place. Being aspie I am having to stop myself going into a rant about what I think should be the bleeding obvious. LOL.